I’m going to catch up on some things I should have posted while ago, and hopefully get back on track posting more often. 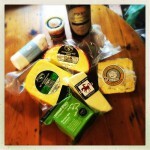 We went to the Adelaide Cheese Festival on the weekend and came home with a swag of cheeses. 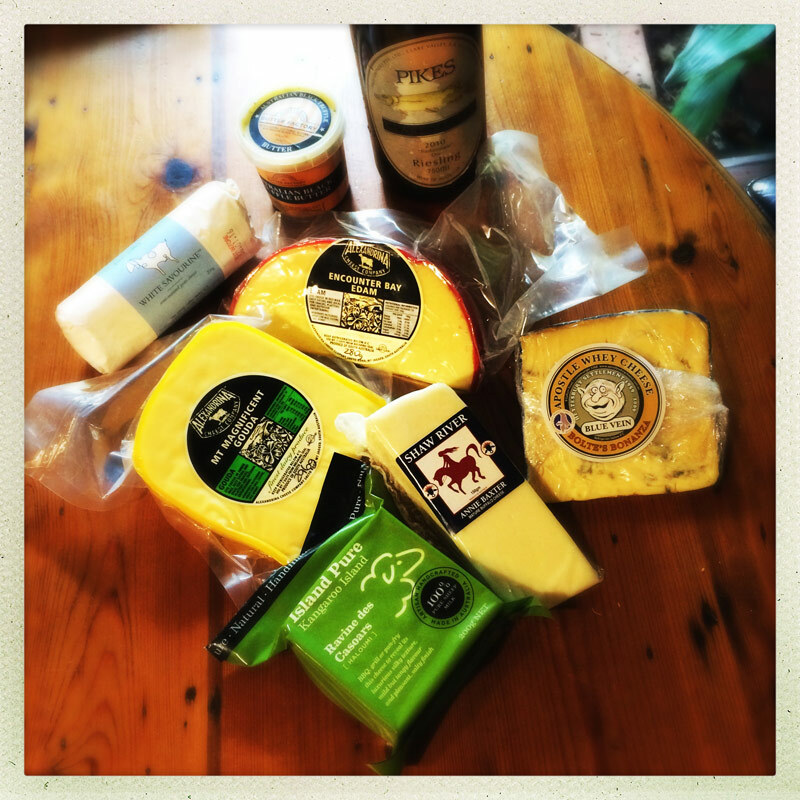 Since we ALREADY had cheese in the fridge, the challenge is to eat it all. So this is a variation on a quattro formagio. Home-made pesto on the base. 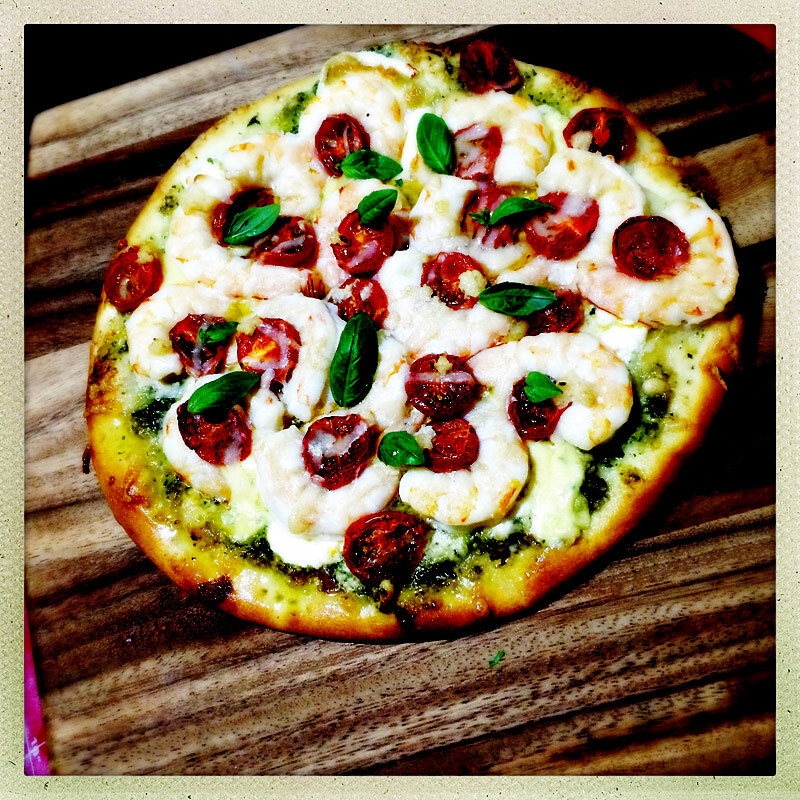 Then gouda, blue vein, ricotta, and goats cheese, garlic prawns, baked cherry tomatoes, grana padano and baby basil leaves. It was let down a bit by the quality of the prawns but otherwise rich and tasty! Pizza night is something of a religious ritual in our house. It happens about once a fortnight on a Saturday or Sunday evening. We almost always make 4 pizzas, since whatever isn’t eaten on the night gets eaten after the next day or two. 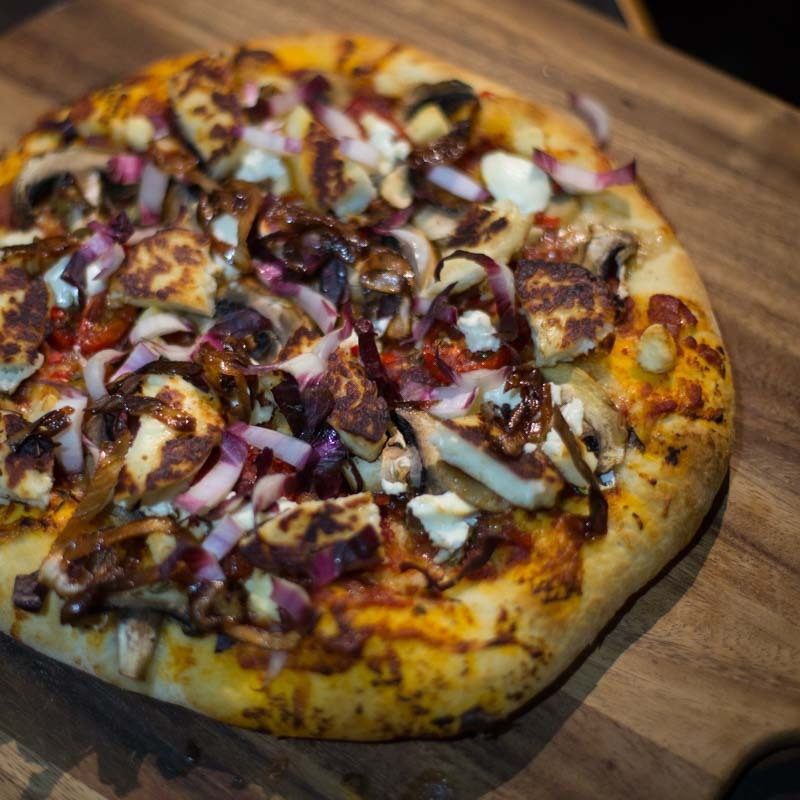 I can happily spend the better part of a day preparing the toppings. Last night I made up a couple of new concoctions which went down pretty well. The pizza based was brushed with garlic oil, then grated gruyere and grana padano cheese were added. Fresh sardine fillets placed skin-side up around the pizza. I then added semi-dried cherry tomatoes -these area great alternative to using a tomato paste. 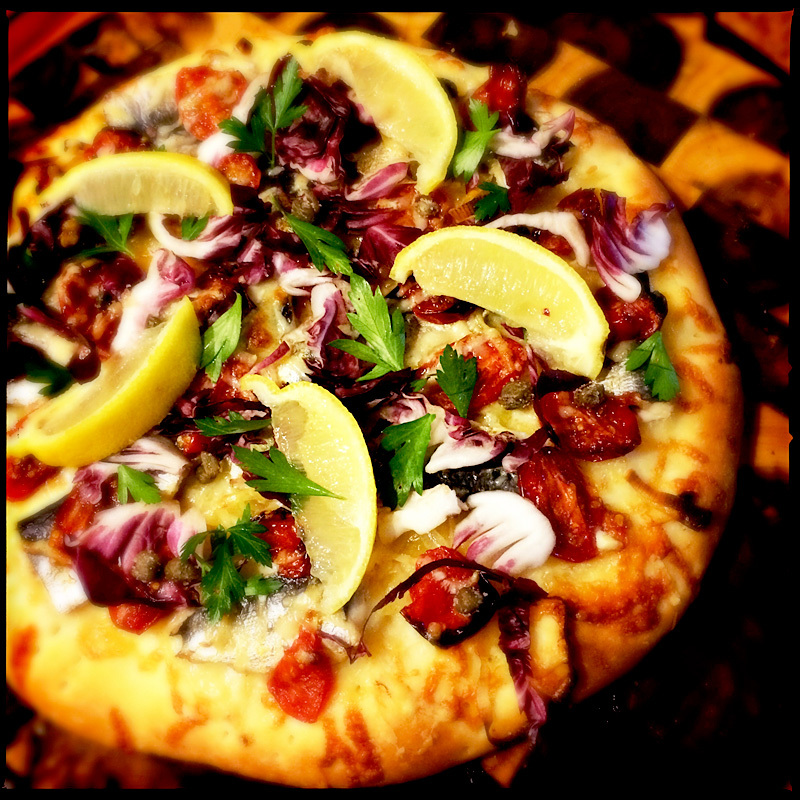 After the pizza came ouyt of the oven I added capers, slices of radicchio, parsley and slices of lemon. Just excellent! This was a bit of a twist on one that I’ve made a few times. 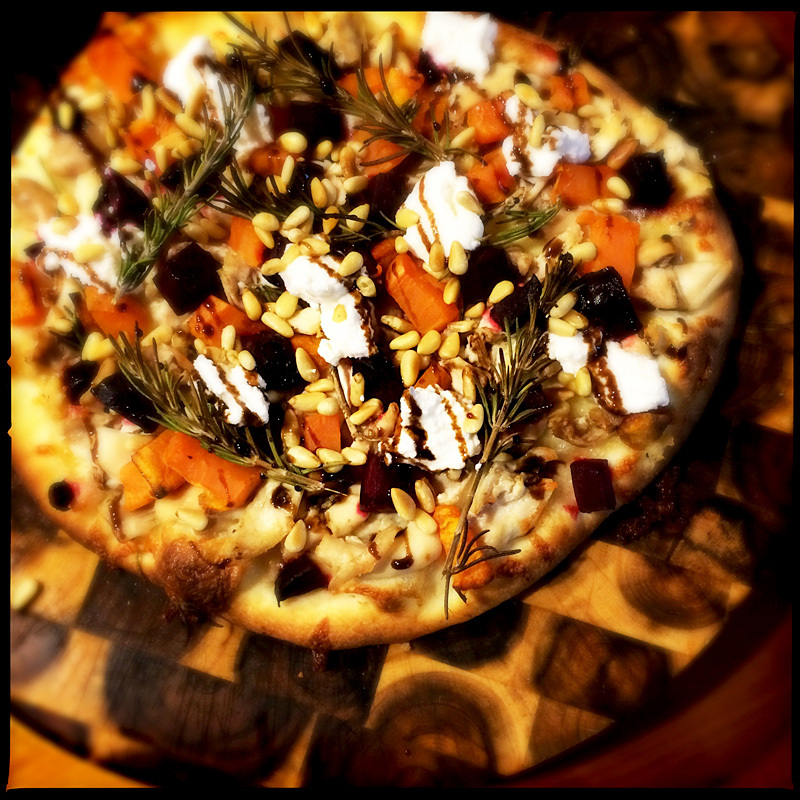 Mozzarella, garlic confit, roast chicken, roast sweet potato, roast beetroot, rosemary. Ricotta, toasted pine nuts and pomegranate syrup were added after it was cooked. Very nice. Goats cheese would have worked fine, and perhaps a bit of diced chilli. 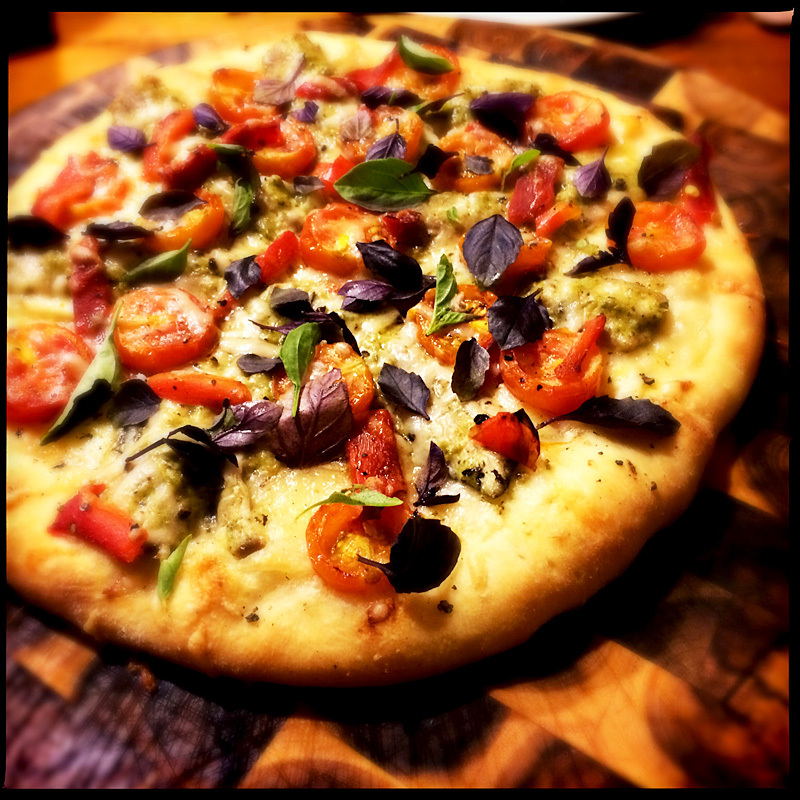 I have a number of pizza recipes and ideas here. Pizza night here tonight. This was the standout. 1. Marinate the sardines in 2 tsp pesto and brush the pizza base with garlic oil. 2. Marinate the sardines in garlic oil and brush the pizza base with pesto. On this occasion we did the first method. Cut cherry tomatoes in half. Sprinkle liberally with sea salt. Leave for 20 mins. Splash with olive oil. Cook at 160C in an oven dish for 30-45 mins. Brush the pizza base with garlic oil or pesto. Scatted with shredded mozzarella. Place raw sardines evenly around pizza (they will cook on the pizza). Place cherry tomatoes in the babes between the sardines. Grate some Grana padano cheese (or parmesan) on top. Cook the pizza. We use a pizza stone and cook for about 10 mins at 220-230 C.
Squeeze lemon juice over the top and add baby basil leaves.